Easily add freshly sliced or shredded ingredients to all of your favorite salads, entrees, sides and more. 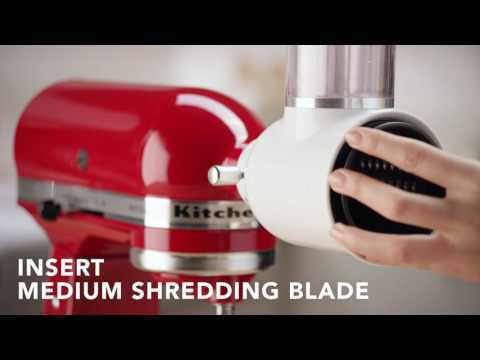 Simply attach the KitchenAid KSMVSA Fresh Prep Slicer / Shredder Attachment to the power hub of your KitchenAid Stand Mixer (sold separately), and let it quickly power through the ingredient of your choice. The 3mm slicking blade is great for cucumbers, carrots, celery and zucchini. The 4mm medium shredding blade is great for cheeses and firm vegetables. The 6mm coarse shredding blade is great for shredding cabbages, potatoes and more. Features ideal slicing performance with the 2-in-1 food pusher for both large and small diameter fruits and vegetables. This simple to store attachment and included accessories pack and organize inside a convenient storage case for easy access and simple storage. All blades are dishwasher safe on the top rack.